What if one day, we could teach our bodies to self-heal like a lizard’s tail, and make severe injury or disease no more threatening than a paper cut? Or heal tissues by coaxing cells to multiply, repair or replace damaged regions in loved ones whose lives have been ravaged by stroke, Alzheimer’s or Parkinson’s disease? Such is the vision, promise and excitement in the burgeoning field of regenerative medicine, now a major ASU initiative to boost 21st-century medical research discoveries. ASU Biodesign Institute researcher Nick Stephanopoulos is one of several rising stars in regenerative medicine. In 2015, Stephanopoulos, along with Alex Green and Jeremy Mills, were recruited to the Biodesign Institute’s Center for Molecular Design and Biomimetics (CMDB), directed by Hao Yan, a world-recognized leader in nanotechnology. Prior to joining ASU, Stephanopoulos trained with experts in biological nanomaterials, obtaining his doctorate with the University of California Berkeley’s Matthew Francis, and completed postdoctoral studies with Samuel Stupp at Northwestern University. At Northwestern, he was part of a team that developed a new category of quilt-like, self-assembling peptide and peptide-DNA biomaterials for regenerative medicine, with an emphasis in neural tissue engineering. “We’ve learned from nature many of the rules behind materials that can self-assemble. Some of the most elegant complex and adaptable examples of self-assembly are found in biological systems,” Stephanopoulos said. Because they are built from the ground-up using molecules found in nature, these materials are also biocompatible and biodegradable, opening up brand-new vistas for regenerative medicine. Stephanopoulos’ tool kit includes using proteins, peptides, lipids and nucleic acids like DNA that have a rich biological lexicon of self-assembly. 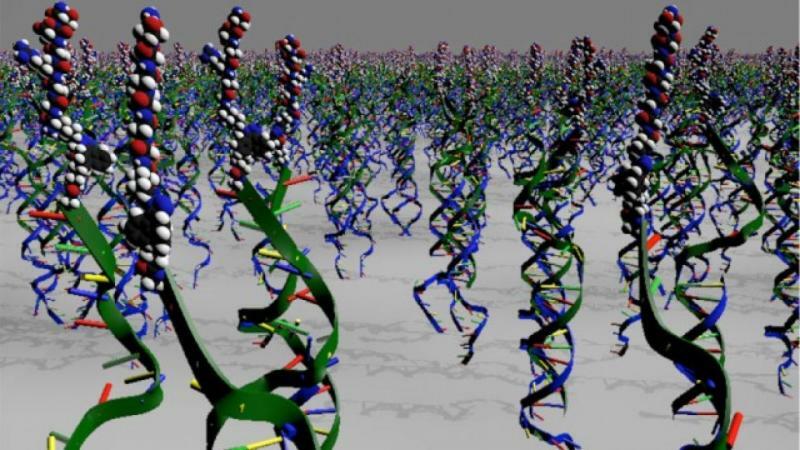 “DNA possesses great potential for the construction of self-assembled biomaterials due to its highly programmable nature; any two strands of DNA can be coaxed to assemble to make nanoscale constructs and devices with exquisite precision and complexity,” Stephanopoulos said.